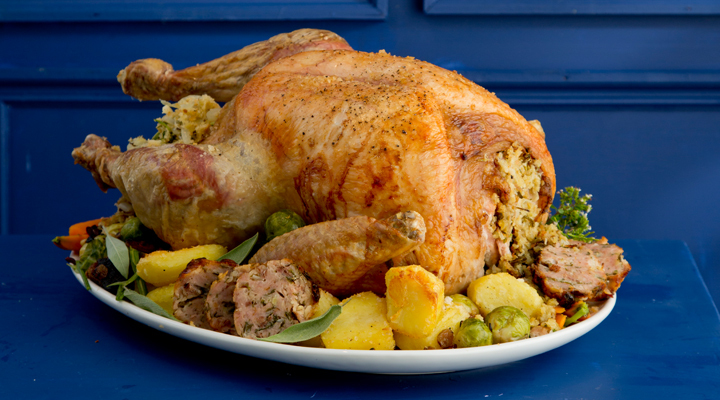 This stuffing will add a bit of Mediterranean flavour to your Christmas dinner. Combine the sausage meat, prosciutto ham, breadcrumbs, Parmesan cheese, onion and fresh herbs in a large bowl. Season with salt and pepper and set aside until needed. If you’re cooking the stuffing separate from the turkey, put it on a piece of tin foil and roll it up like a sausage. Cook in an oven preheated to 180°C/gas mark 4 for 30 to 40 minutes, until cooked through.